National/Team Estrade//– The festive season is almost here and chances are that you fall in the ‘I don’t know what to wear’ group. 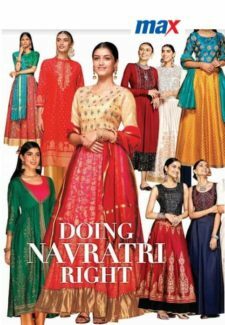 Flaunting the best of your style on the 9 days of Navratri may seem like a Herculean task, but we got your back, with 9 trends that will keep you looking fashionable every time. You have heard it all about red being the perfect colour for the festive season. This time, put your own spin to it. Embroidery for a night of celebration? Why not! Opt for the ornate details that will stand out. Care for a little clash of colours to make it more interesting than ever? Team it up for the ultimate contrast. Blue and yellow anyone? A sheath dress for a day of Navratri is the new cool. Prove the naysayers wrong as you don it with the perfect accessories. We know that excessive dressing may take a toll, so why not keep it striking yet comfortable? Opt for suits paired with straight trousers or keep it sleek with a smart, layered version. Why stick to one for all 9 days of festivity when you can experiment with several? From flared to straight-fit, try them all- the more the merrier! Be it flaunting a different style or wearing a not-so-traditional ensemble, don’t be afraid to go off-beat. The right print will have heads turning, make sure you pick what suits you best. MODERN TRADITIONAL- NOTHING BEATS THE ELEGANCE OF A LEHENGA, BUT THAT DOESN’T MEAN YOU CAN’T PERSONALISE IT ACCORDINGLY. FOR INSTANCE, SECURE YOUR DUPATTA WITH A BELT OR DRAPE IT – WHATEVER WORKS TO SUIT YOU.